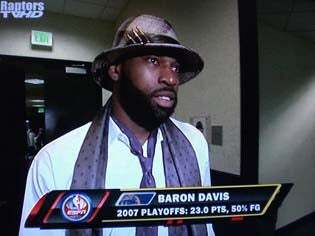 Baron davis wants to be ... a Knick? OK, it's not a lock that Baron Davis is leaving the Warriors. But by opting out of the final year of his contract — leaving $17.8 million on the table in the process — it's pretty clear that there was more to that dustup with Don Nelson in the Phoenix game than we were told. But while that may be true, a certain ESPN Cheese Doodle-loving personality says he knows a different reason for Davis wanting to leave. It's because ... he wants to be a New York Knick? What? Stephen A. Smith, sounding unusually subdued and somewhat tongue-tied in a segment with Stewart Scott last night on the WWL, says that Davis' dream has always been to be a Knick; which is evidence of insanity in many states. The official line: Davis wanted to renegotiate his contract and the Warriors wouldn't play ball, so he's wading out into the market. Here's hoping he's signed by the Pistons, thus forming the awesomest beard combo in the history of basketball. Golden State of Mind also examines possible Davis motives.